The functionality of the standard trading platform is relatively meager at first glance. Because of this, when trading on average time intervals, many traders prefer to use third-party services for market analysis. However, a considerable number of users prefer to trade turbo options for 1 minute, for which analysis is done on second time frames. Therefore, we have decided to discuss in this article a trading strategy that will allow you to build effective forecasts directly on the trading terminal. As of January 2018, many platforms have in their features the 5 most popular indicators, and this allows for the use of 120 different combinations. Plus, there are more than 30 different auto-figures for drawing on the chart. The available assortment of tools does not compare at all with “Analytics” section of our site, but even the existing set is enough for more than 1,000 different strategies. Moreover, there are opportunities for analysis on the terminal which are not available on other popular platforms. We’re referring to adding the Moving Average not just to the main chart, but to an area with other indicators, like the RSI. The trading system we are going to discuss in this article is based on this particular non-standard approach to market analysis. During the first stage, we select the asset that we will trade. From the point of view of strategy effectiveness, this doesn’t really matter. 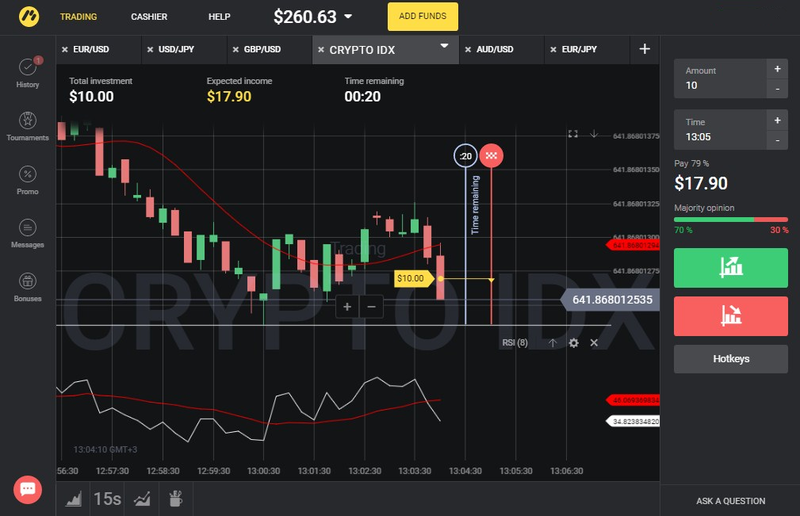 But on an interval of 15 seconds it is recommended to use CRYPTO IDX, and for 30 seconds and above use any currency pair. Next, we need to add 3 indicators to the chart. • RSI (Relative Strength Index) – period: 8, overbought/oversold zones are hidden or set to 100-0 levels. • SMA (Moving Average) #2 – period: 15, color: red, field: RSI rsi 8, type: simple. As a result, the chart should show two moving averages. 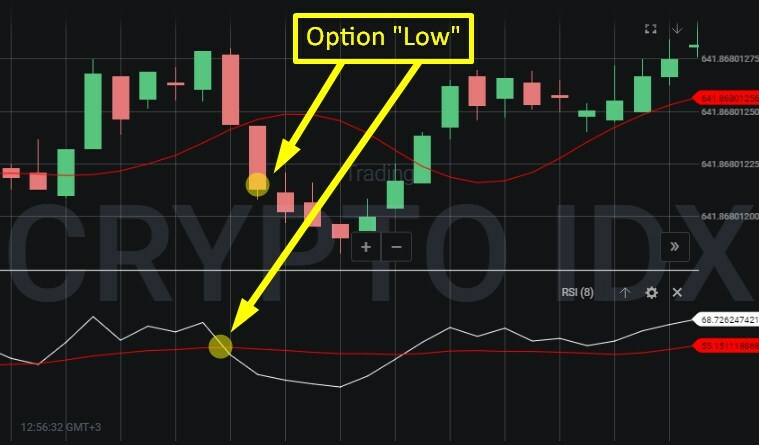 One of them will be located on the candlestick chart ( analysis should be conducted in this mode), and the second one should be in the area with the relative strength index. 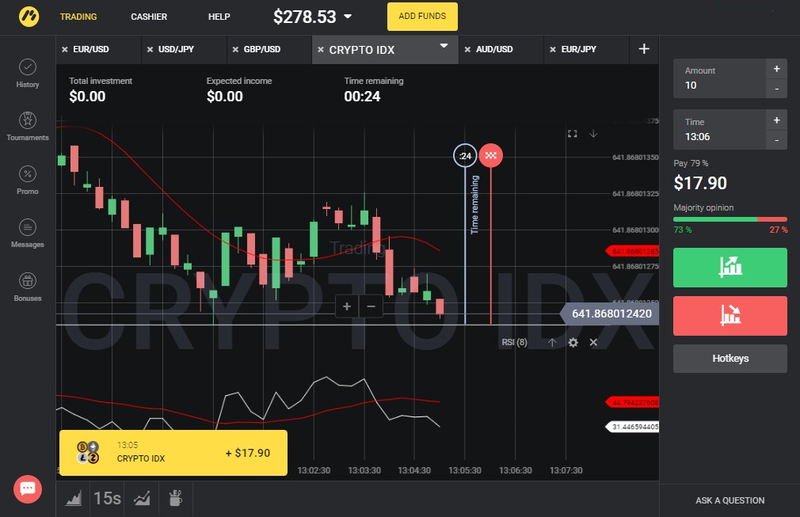 For the sake of convenience, you can scale the chart with the mouse wheel, or make fine adjustments with the mouse by clicking on the timeline at the bottom of the chart and the column indicating the price of the asset, located on the right side. The signal for an upcoming price increase in the next few bars is the intersection of the moving averages. The optimal moment to enter is the end of the formation of the signal candlestick (just a few seconds before it closes), or at the moment the new bar is opened. • the candlesticks on the chart similarly overtake the TMA, breaking through it. • the intersection of the SMA with the indicator line in the Relative Strength Index window. In the above pictures, the indicators are signals from the chart. In addition, it should be noted that the signal candle, the one that breaks through the Triangular Moving Average, should have on the price chart a fairly long body and minimal shadows, which ideally would be absent altogether. If the moving is broken through by a candlestick with no body at all (a doji), or the total length of the two shadows exceeds its main body, that signal should be ignored. We’ve looked at a very unusual strategy, because we don’t usually add any additional moving averages to the indicator area. However, this approach is used by some traders. The effectiveness of any trading system is tested in practice, which we will now do. We will open a trade using this strategy specially for our site. 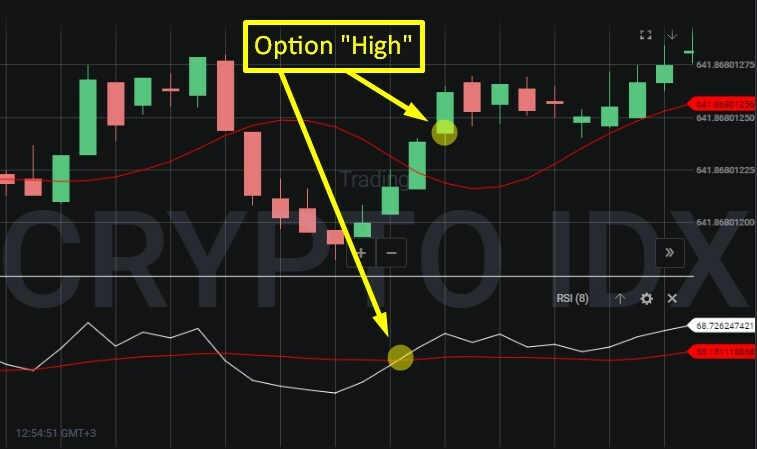 After receiving the trading signal, an option “Up” was purchased for 15 seconds. For our trading asset, we chose CRYPTO IDX with an expiration period of 1 minute and a time frame of 15 seconds. As you can see in the picture, it was done 23 seconds before the closing of the trade. The operation closed in the black. With our $10 invested, we received almost $8 in net income. The signal on the trading system that we saw has fully justified itself. On a mobile market with high volatility, this system always shows good results. However, during flats, the signals are reduced, as is the case with most other strategies unless they are adapted specifically for horizontal trends.